Tessa Longbons | November 15, 2018. Arizona’s abortion report for 2017, published online by the Arizona Department of Health Services in October 2018, shows that abortions in the state declined from 2016. The 2017 report is the first with information on babies born alive during abortions in Arizona. *Statistics are for Arizona residents only. Information on Planned Parenthood’s Arizona market share is not publicly available. The total number of abortions reported in Arizona decreased by six percent from 2016 to 2017. 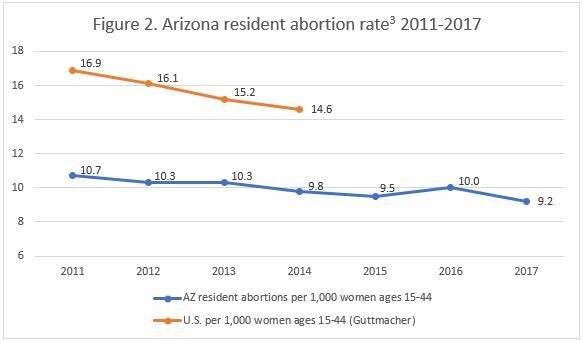 Abortions performed on women with valid resident status in Arizona also declined by six percent, falling from 13,170 abortions in 2016 to 12,336 in 2017 (Fig. 1). Most of the information contained in the report is for resident abortions only. 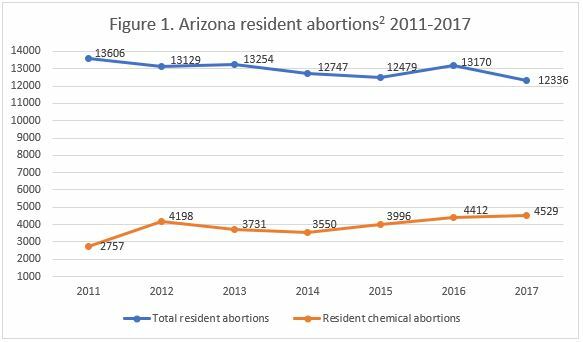 Chemical abortions performed on residents increased by approximately three percent from 4,412 in 2016 to 4,529 in 2017, making up 37 percent of Arizona resident abortions in 2017. Resident abortions have dropped by nine percent from 2011, the first full year after Arizona updated its reporting process and moved the reporting system fully online. The resident abortion rate decreased from 10.0 abortions per 1,000 resident women in 2016 to 9.2 in 2017 (Fig. 2). The vast majority of abortions reported in Arizona, over 98 percent, were performed on Arizona residents. Arizona’s abortion report contains demographic information for abortions performed on residents only. Fifty-nine percent of the abortions performed on Arizona women were on women in their twenties. Ten percent were age 19 and younger, 28 percent were in their thirties, and four percent were age 40 or older. Non-Hispanic white women composed the largest racial group, undergoing 39 percent of Arizona abortions. Hispanic women were a close second at 38 percent, and black women were 10 percent. Forty-six percent of the resident women getting abortions had at least 12 years of education: 19 percent had finished 12 years of school, 24 percent had completed 13 to 16, and four percent had 17 years or more of education. Just seven percent had fewer than 12 years of schooling. However, 46 percent did not report their level of education. As in other states, the majority of women undergoing abortion (86 percent) were unmarried. Fourteen percent were married. According to Arizona’s abortion report, Arizona recently took steps to improve the reporting of this data point; in previous reports, marital status was unknown in a large percentage of cases. Less than half of the women, 43 percent, reported no previous live births. Twenty-two percent reported one prior live birth, and 35 percent reported two or more. Sixty-four percent reported no prior abortions. Twenty-four percent had one previous abortion, and 11 percent had more than one. The majority of women, 80 percent, reported zero prior miscarriages. Fourteen percent had had one miscarriage before. Just four percent of the Arizona residents getting abortions had more than one previous miscarriage. Abortions in Arizona tended to be performed early in pregnancy – 90 percent occurred at or before 13 weeks of gestation. Sixty-five percent were performed at eight weeks or earlier, and a quarter were performed between nine and 13 weeks. Four percent occurred between 14 and 15 weeks, two percent between 16 and 17 weeks, and another two percent between 18 and 20 weeks of gestation. There were 157 abortions performed at 21 weeks of gestation or later. In Arizona, abortion is prohibited after viability unless the life or health of the mother, broadly defined, is at risk. Arizona passed a law to prohibit abortion after 20 weeks, when babies can feel pain, but the law was overturned by a court decision and the Supreme Court declined to hear the case, so it is not in effect. Some abortions were performed because of maternal or fetal medical conditions. Six women were diagnosed with HELLP or preeclampsia, nine had pre-pregnancy medical conditions, and 16 had other or unspecified conditions. Additional women had other conditions, although numbers smaller than six were suppressed to protect women’s privacy, so exact totals are unknown. Older women tended to be more affected than younger women; the number of women age 24 or younger with medical conditions was suppressed for being fewer than six, but nine women between the ages of 25 and 29, 13 from the ages of 30 to 34, and 10 age 35 or older had health problems affecting their pregnancies. The majority of abortions for health conditions occurred at 13 weeks of gestation or earlier. There were 95 abortions performed due to fetal medical conditions. Seven babies were aborted because of aneuploidy, triploidy, or trisomy, and 69 were aborted for fetal hydrops. Totals for other conditions were suppressed because the numbers were small. Again, mothers tended to be older – 69 percent were age 30 or older. Eighty-eight percent of these abortions were performed at 14 weeks of gestation or later. In Arizona, medical professionals who treat women for complications caused by abortion are required to report them to the state. Twenty of the abortions performed on Arizona residents were known to have resulted in complications1. Although the complication reporting form asks doctors to describe the nature of the complication, this information was suppressed or unspecified in the report. Fifty percent of the reported complications resulted from abortions performed at 13 weeks of gestation or earlier. Arizona requires parental consent before a minor may obtain an abortion. If a girl wishes to get an abortion without parental consent, she may file a petition requesting authorization from a judge. In 2017, 32 petitions were filed. Of these, 31 were granted, including 30 without parental consent. Arizona is one of only eight states to report information on the judicial bypass process. Twenty-two abortion facilities reported abortions to the state in 2017, up from 19 the year before. The month of March had the most resident abortions, 1,309, and November had the fewest, 828. None of the babies killed by abortion was donated to be used for fetal tissue research or other experimentation. Seventy-four babies were buried or cremated. In August 2017, a new law went into effect to expand Arizona’s protection of the lives of babies born alive during abortions. The law clarifies the criteria for a born-alive infant – that he or she be breathing, have a heartbeat, pulsation of the umbilical cord, or movement of the voluntary muscles. The law also mandates that abortion centers and hospitals that perform abortions at or after 20 weeks have protocols in place to treat babies born alive. In cases where the baby has received a fatal diagnosis before the abortion is attempted, the doctor must inform the mother that if the baby is born alive treatment must be provided to sustain the baby’s life. From August to December 2017, 10 babies were born alive during abortions in Arizona. The abortion report does not specify whether any of these babies survived past birth or where they are now. In a Charlotte Lozier Institute study of abortion reporting across the 50 states, New York City, and the District of Columbia, Arizona tied for third place. Arizona reports the majority of the information it collects. However, Arizona could further improve its reporting by providing details on all abortions performed in the state, not just those performed on residents. Additionally, the state could report the outcome of babies born alive during abortion. Overall, however, the Grand Canyon State is a strong protector of life, scoring first place on Americans United for Life’s 2018 Life List and recently passing a law to strengthen its reporting process. Starting in January 2019, Arizona will collect information on the state’s informed consent process, reasons for abortion, the types of facilities and doctors involved in abortion, and more detailed information on abortion complications. The chemical abortion total for 2011 excludes abortions in which fetal death was induced with digoxin. Digoxin was not included as an abortion method in later reports. Arizona passed a law revising its abortion reporting process in 2010. 2011 was the first full year of information collected after the law was enacted.